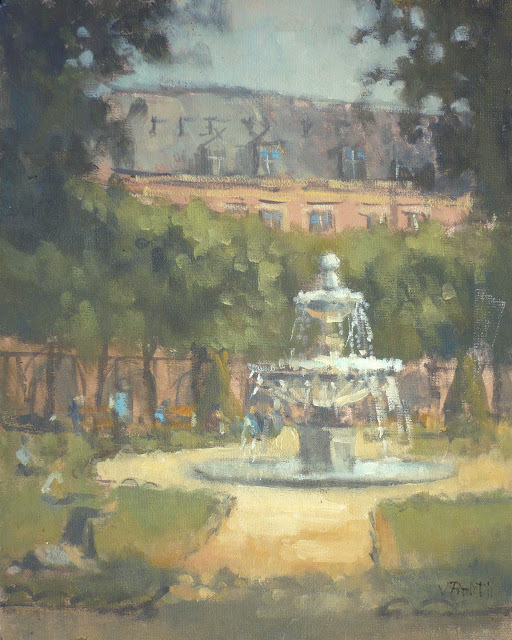 I went to Paris for a few days to paint in May and produced around 10 paintings but they all need some small tweaking and I've just got round to finish 2 of them. 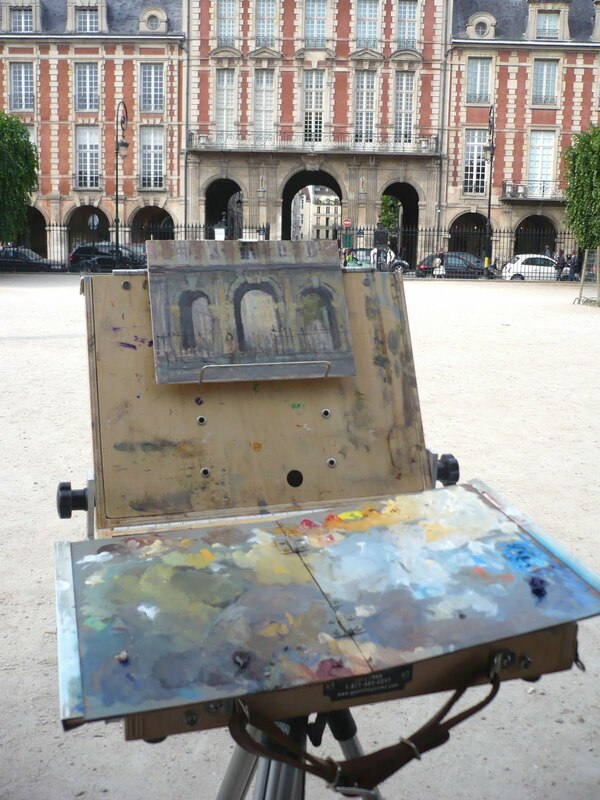 The painting below was made at my favourite square in Paris which is "Place des Vosges" in the beautiful "quartier du Marais". There was a great feeling about the place; children were playing football, students were sunbathing and families were having picnic on the grass. I found a nice quiet shady spot to paint but I soon felt there were many people gathering and taking pictures behind me. I was about to get my best pen out to start signing autographs for my new fans when I realised they were taking pictures of the famous Louis XIII sculpture that was just behind me! 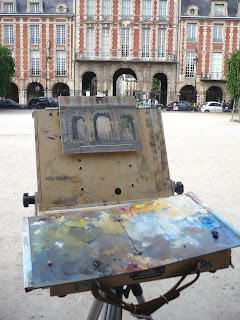 Afterwards I did a second painting at the same place facing the beautiful arches of the building. I loved the way the light was showing through the arches. The little girl you can see on the painting is called Violette. She was playing on the square with her brother and had been quietly observing me doing both paintings and would every now and then come and say a few nice words to me. She was so cute I suggested to put her in the painting if she could stand in the distance for a few minutes. Her position looked a bit rigid as it was probably the first time she had to "pose" for someone but she couldn't help smiling the whole time. Hi again Valérie. I'm beginning to get the hang of typing 'e' acute now! Thank you very much for taking the time to visit and comment on my blog too - very much appreciated. These are both lovely paintings. I like the figures relaxing and enjoying the sunshine in the first one particularly. Very nice Valerie. I particularly like the warm harmonies in the top piece. You did well to set up in spaces with so many people around. I guess it comes with the territory in urban scenes. Look forward to seeing your other paintings from Paris at some point. 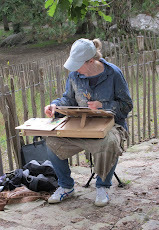 Great paintings, under difficult conditions as well. I would find it very difficult to do these paintings with such a big crowd milling about. 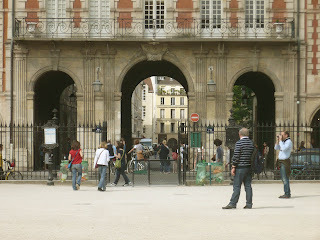 I am use`to people watching but in Paris, well, that`s a different story. Well done Valerie, and all the best. 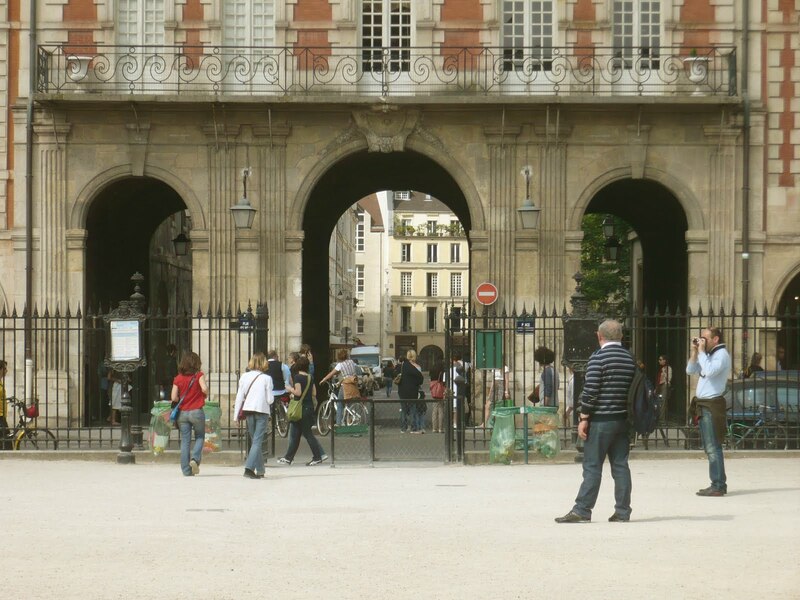 I am so glad to see the long awaited Paris paintings. Both of these are great but I'd have to say the first is my favorite because of all the beautiful colors.I love your architecture, as you know, but I also really admire how you paint the greens in your trees. 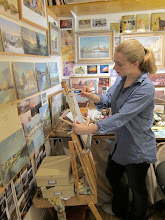 I have sent several Texas friends to your blog to see your paintings. Thanks for your comments Michael, David, Victor and Douglas. It wasn't too bad actually to paint there as people were very relaxed and most stayed on the grass so I only got "disturbed" by children which was actually a nice distraction. 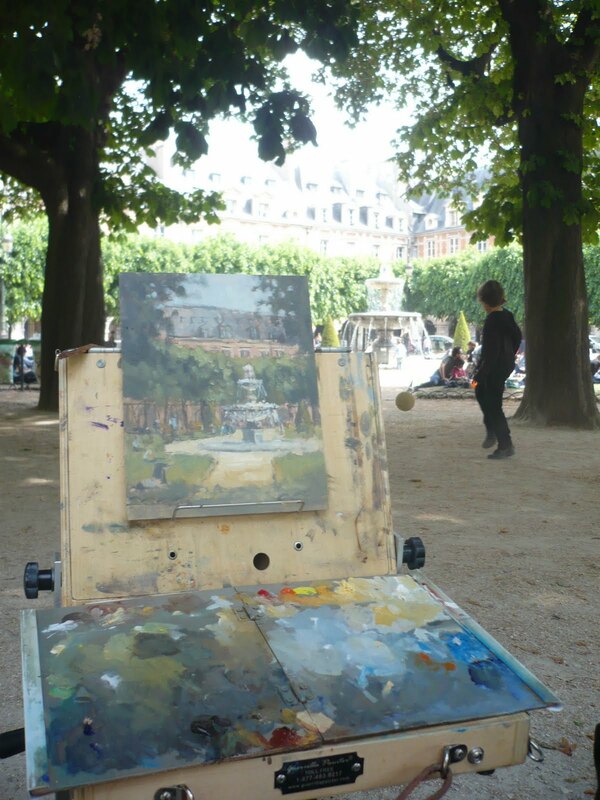 Painting in Montmartre was an other story and I'll tell you about it in a future blog. About the colours, you might be interested to know that the colours of the red building on the first one is actually my tinted primer coat which I left untouched as I thought the colour was quite good. Sometimes less is more! You are very brave to stand in such public places and paint. I like the outcome of the Fountain picture and the warm colours and the way you have tonally merged the foreground dark trees with the distant trees. I've tried a tree framed picture on a couple of occasions but found it's very difficult to make work convincingly. 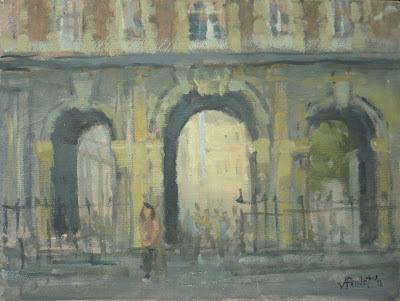 I recently noticed a painting by Ken Howard, Lake Palace Hotel, Udaipur (on the Richard Green Gallery website) which seems to pull it off, by the merest suggestion of a foreground, in a dark tone, almost as a frame to the picture, then a much higher key distance image, it captures the heat of the day brilliantly. Worth a look. Thanks Ian! 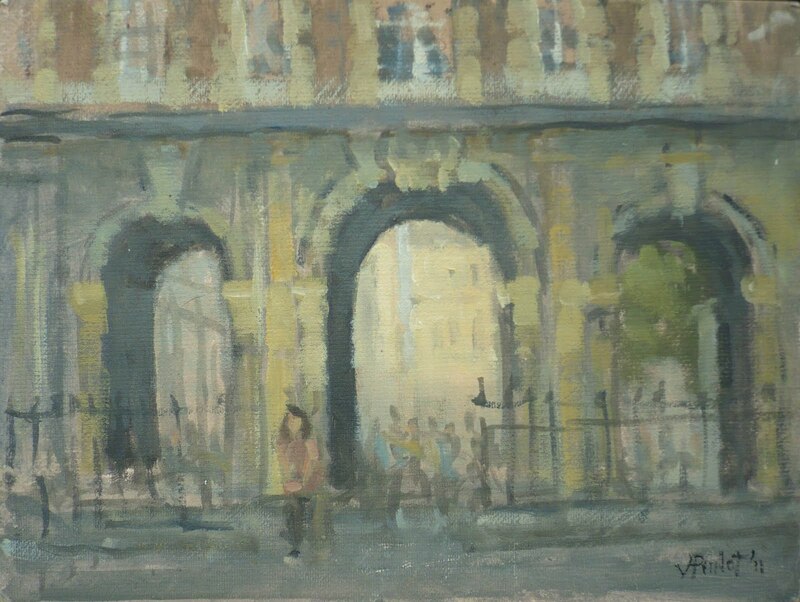 I had a look at that painting from Ken Howard and it's lovely indeed, thanks for the tip. Looking forward to seeing this "favorite square" for the first time. 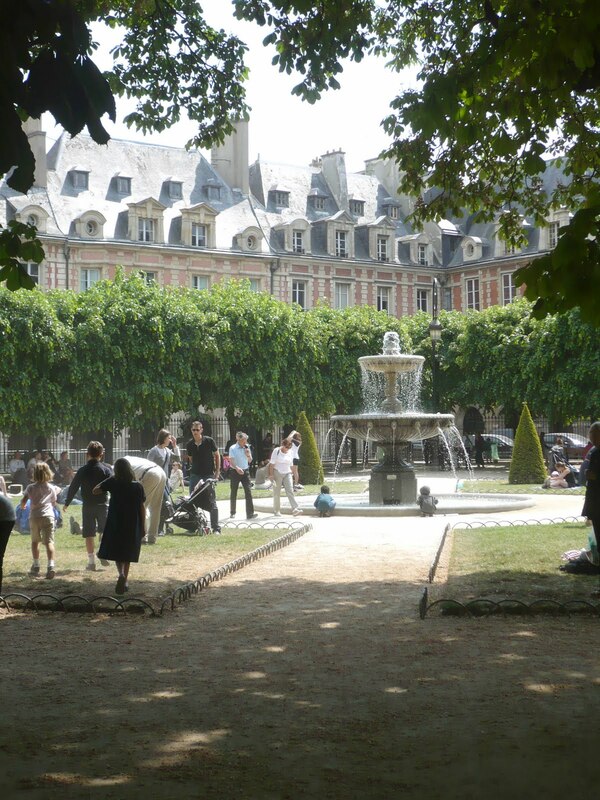 I'll be staying at the Hotel Place des Vosges in mid-september with my family on my first visit to Paris. 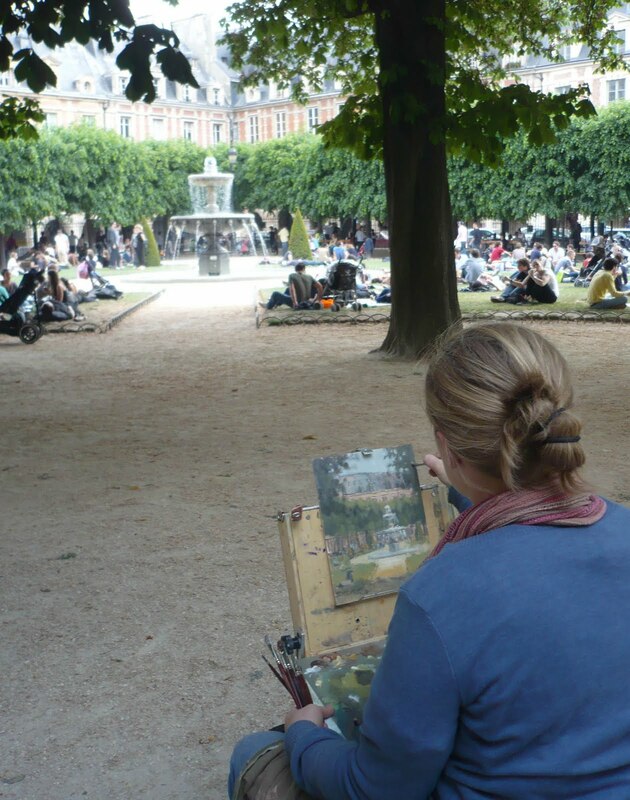 I hope it looks just as lovely as your painting shows.